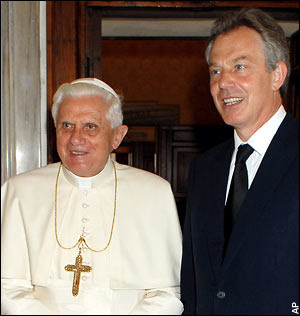 Tony Blair was on the brink of announcing his conversion to Catholicism on a visit to the Pope until a last-ditch intervention by Britain's Roman Catholic leader. The former Prime Minister was planning to make the historic statement on a trip to the Vatican, but was persuaded not to at the 11th hour. Cardinal Cormac Murphy-O'Connor, the Archbishop of Westminster, advised Mr Blair that it would be unwise and inappropriate to use such a high-profile occasion for such an important private event, particularly coming just days before he was due to leave Downing Street. He was preparing to make a declaration about his faith as one of his last acts as Prime Minister. But the cardinal recommended that it would be better to wait until he had left Number 10, amid fears that the announcement could cause a political storm. It is understood that he has received instruction from Fr John Walsh, a chaplain at RAF Cranwell, and Fr Mark O'Toole, the cardinal's secretary, in preparation for conversion. He had already told aides that he intended to convert to Catholicism and was believed to have been planning the visit to the Vatican in June as the perfect opportunity to announce the momentous step of becoming the country's first Catholic Prime Minister. However, The Sunday Telegraph has also learnt that he has since put his plans on hold, despite leaving office, because of fears that it could jeopardise his work as an envoy in the Middle East. There had been speculation that he would formalise his Catholic beliefs in the next few days, but it is understood that it is likely that he will not convert until next year, probably at Easter. A source close to Cardinal Murphy-O'Connor said the Archbishop had advised Mr Blair that any statement on his conversion "should be done reflectively". "There was a question over whether this was the time to make such an announcement," the source said. "The cardinal's concern for Mr Blair was pastoral and he told him not to do it then, but to wait for a more private occasion." The cardinal was called to the papal study in the Vatican for a private meeting with Pope Benedict XVI and the former Prime Minister, which lasted around 10 minutes. "For him to be invited to the audience [with the Pope] is significant," said a Vatican insider. "It is unusual for a representative of a local Church to be present at an audience between the Pope and a prime minister." After the meeting - during which Mr Blair gave the pontiff a frame containing three photographs of Cardinal John Henry Newman, the most famous of English converts to Rome - the cardinal hosted a lunch for him at the English college. Mr Blair's desire to become a Catholic has been an open secret for years, but doing this while still at Number 10 would have been controversial as some lawyers believe that the 1829 Emancipation Act, which gave Roman Catholics full civil rights, may still prevent a Catholic from becoming prime minister. Clauses in the Act state that no Catholic adviser to the monarch can hold civil or military office. Also, it would have caused a potential conflict with his role in choosing Church of England bishops. He also attended Mass at Westminster Cathedral with his family, who are all Catholics - his two sons attended the London Oratory, a Catholic school. Areas that he must cover before he can become a Catholic include the Creed, prayer life and the Church's doctrine. It is believed that he will be received into the Church by the cardinal. During the service he will recite the Nicene Creed and make a formal declaration that reads: "I believe and profess all that the Holy Catholic Church believes, teaches and proclaims to be revealed by God." Mr Blair was initially introduced to religion by Peter Thomson, an Australian priest, during his time at Oxford University where he was prepared for confirmation by Graham Dow, an evangelical Anglican cleric who is now Bishop of Carlisle. More recently he has developed a friendship with Prof Hans Kung, the respected theologian.